How Many Homes Were Built by Owner in 2014 - Armchair Builder :: Blog :: Build, renovate, & repair your own home. Save money as an owner builder.- Armchair Builder :: Blog :: Build, renovate, & repair your own home. Save money as an owner builder. It’s interesting to see how many homes are built by owner builders each year in the permit numbers put out by the U.S. Census Bureau. One of the more common questions asked by people wanting to build a new home is, “Can an average person manage the construction of their own home as an owner builder?” Well, the Census Bureau Building Permits Survey numbers should help answer the question. So let’s take a closer look at the the pie chart below. The chart represents the total number of private single family homes completed in the U.S. in 2014. These are single family, meaning they are built for one family to live in as opposed to multi-family housing. It’s also important to note that these numbers represent privately owned housing units as opposed public housing. 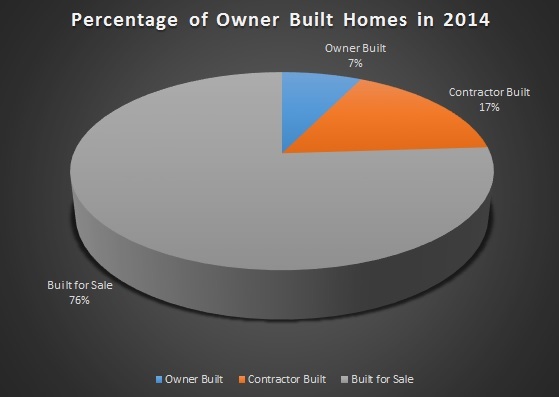 The Owner Built number of seven represents the percentage of homes built by people that completed their own new home while acting as the general contractor in 2014. Some people call these owner builders…or what we like to refer to as Armchair Builders. This number represents forty-three thousand people that took on the challenge and successfully built their own home last year. The Contractor Built number of seventeen percent refers to the number of general contractors that built single family homes for a client. Meaning, the owner hired a general contractor, who then managed the entire home build from start to finish for the client. The Built for Sale number in the chart represents the homes that were built by builders and developers in order to sell to the public. These homes are sometimes called spec homes…short for speculation…meaning the builders are speculating that a buyer will come along to purchase the partially or completely finished home. So, owner built homes make up a significant portion of the new homes created each year. For those of you thinking about taking on the challenge, you may want to check out some of the owner builder resources at the Armchair Builder e-Store. These pro builder tools were created from the experience of building hundreds of homes and should help level the playing field for those wanting to save money and manage the project themselves.